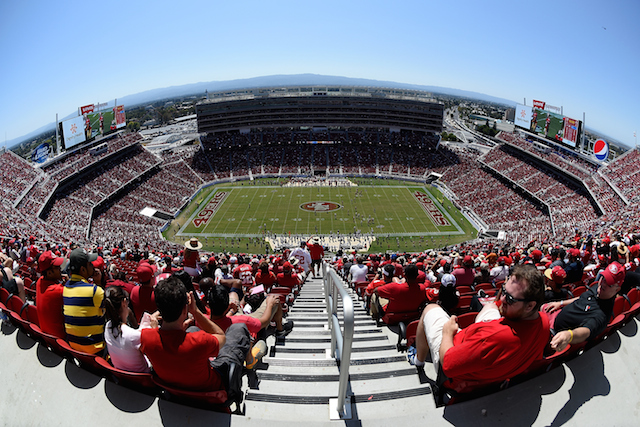 On Sunday, September 14, the San Francisco 49ers’ brand new Levi’s Stadium will host its first regular season NFL game when the Niners welcome the Chicago Bears to Santa Clara. The state-of-the-art facility cost $1.2 billion to construct with a capacity of approximately 68,500 people, and is sure to be a beautiful and outstanding venue for watching football. Stadium Journey has been doing this sort of thing for a while; their team has reviewed nearly 2,000 different stadiums in 41 countries and utilizes a staff of 116 correspondents around the globe (including one writer who watched a game at every NFL stadium in person in 2013). Here are the site’s top five places to watch an NFL game based off the most recently completed season. 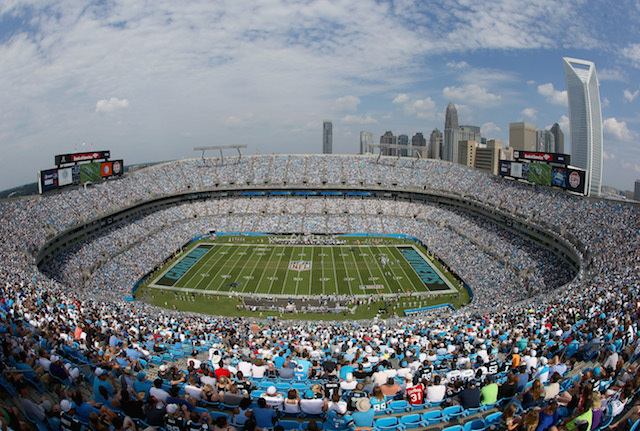 Charlotte’s Bank of America Stadium, home of the Panthers, is the initial entry on this list. The defending NFC South champions have called the building home since it opened in 1996, the second year of the team’s existence. Bank of America Stadium has room for 73,778 fans. As you can see from the picture above, the stadium boasts a gorgeous view of the downtown Charlotte skyline. Stadium Journey gave it a perfect score in the areas of ‘food and beverage,’ ‘neighborhood,’ and ‘extras.’ With the Panthers looking like a potential playoff threat behind star quarterback Cam Newton and a stingy defense that features linebacker Luke Kuechly, fans in North Carolina can enjoy watching a great team in a great environment. The Dallas Cowboys’ AT&T Stadium should be on every sports fan’s bucket list if for no other reason than the unbelievable video board suspended over the field. 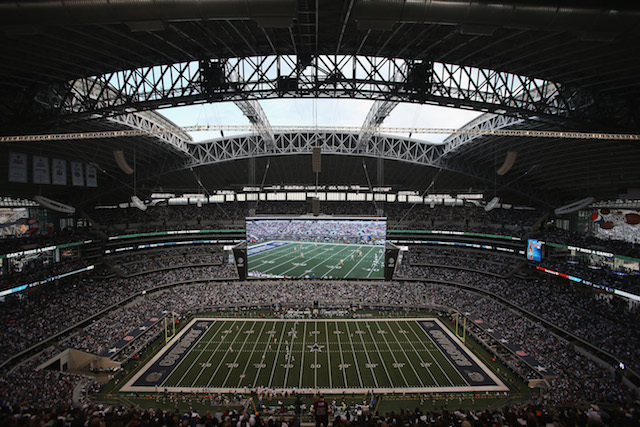 ‘Jerry World,’ which is actually located in Arlington, seats 80,000 comfortably and has also registered a few six-figure crowds due to standing room tickets. Forgive the fans if they spend more time watching the screens than the game; the Cowboys’ 600-ton video board is easily AT&T Stadium’s most impressive feature. The building also has plenty of uses besides pro football, including hosting the 2010 NBA All-Star Game, the 2014 Final Four, and — coming soon — the inaugural College Football Playoff championship game. In addition, AT&T Stadium was the site of Super Bowl XLV. 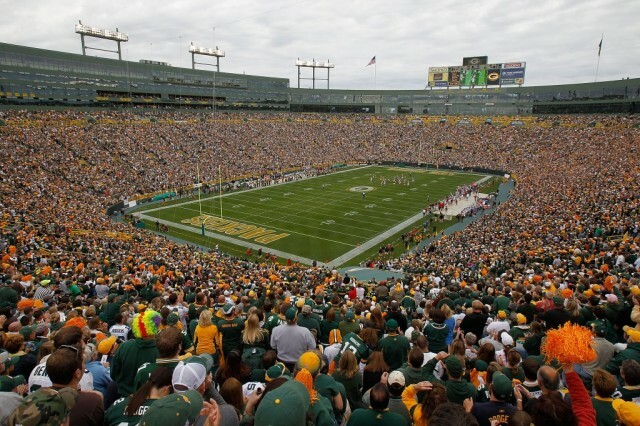 Lambeau Field in Green Bay, Wisconsin is one of the most traditional and classic stadiums in the league. The home of the ‘frozen trundra’ has been hosting Packers games since 1957 when the then-City Stadium’s capacity was just 32,500 seats. Lambeau is now hosting its 58th year of football and — thanks to various expansions over the decades — holds 80,735 fans. Er, cheeseheads. As Stadium Journey points out, the passion of Packers supporters is unmatched. “These fans own their team. Literally.” Expect a sellout crowd — although that prediction doesn’t take a lot of boldness on our part. It’s been that way every game since the Kennedy administration. The Pittsburgh Steelers’ Heinz Field opened in 2001, replacing Three Rivers Stadium as the home to the team with more Super Bowl rings than any other. The open-air stadium seats 65,500 spectators. Stadium Journey gave the home of the ‘Terrible Towel’ a 4.9 rating on a 5.0 scale, and the Steelers do have quite the bright yellow home-field advantage. 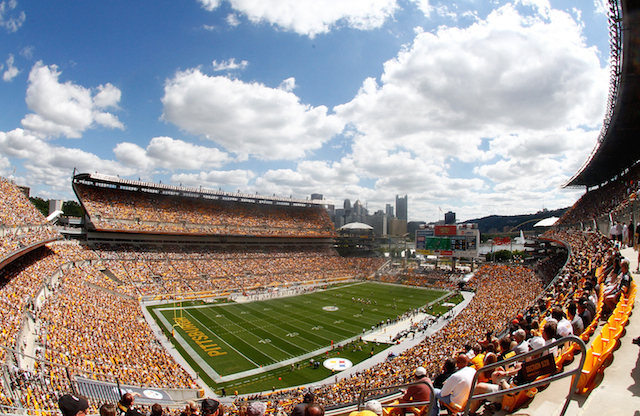 Every game at Heinz Field has been sold out since the facility opened. With Pittsburgh’s significant following, both in Pennsylvania and around the country, we doubt that will change any time soon. 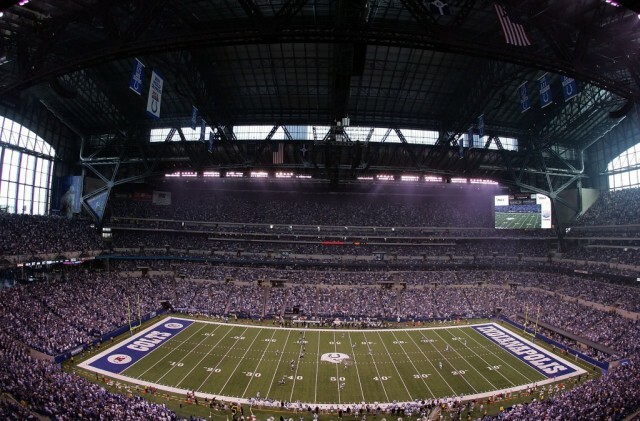 Indianapolis, Indiana’s Lucas Oil Stadium, which opened in 2008, tops the Stadium Journey NFL rankings for the third year in a row. The home of Andrew Luck’s Colts seats approximately 63,000 fans for football games. Lucas Oil Stadium has also hosted the Final Four (and will again in 2015) and Super Bowl XLVI. The building features a retractable roof that can be opened or closed in about 10 minutes, and there really isn’t a bad seat in the house. How many of these five stadiums have you been to? Which was your favorite? What stadium would you add to the top five? Tell us in the comments.